Even people who are bedridden can partake in some movement to promote healthy joints and mobility. Range of motion exercises don’t involve lifting weights or exerting yourself. These are simple workout moves that just about anyone can do. Wave your arm forward in a circle several times and then reverse the movement. You can perform similar motions with your legs. Many individuals who have limited mobility are afraid to exercise because their balance may not be strong and they’re concerned about falling. Gravity can take a toll on the joints and make your osteoporosis and arthritis symptoms flare. One way to reduce these unfortunate pains is to try limited exercises in a pool. 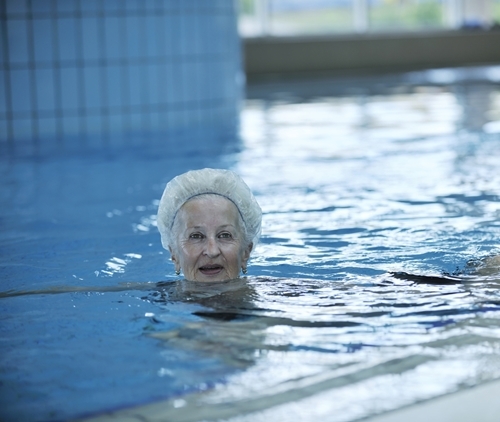 Many senior care facilities, community centers and gyms offer senior workout programs such as Pilates and yoga in a heated pool. The warm water soothes sore joints and muscles and reduces the effects of gravity, making movement much easier. Once in the pool, you’ll be equipped with flotation devices such as wings that go over your arms. Then, an instructor will demonstrate a position, like chair pose, or move, such as the doggy paddle, for you to try. The amount of movement that you can easily perform will affect what you can do. Don’t be afraid to try modified versions of the exercises that allow you to be involved without causing pain. Lifting doesn’t always require barbells and fancy equipment. Those with limited mobility can benefit from lifting much smaller items, like a half gallon of milk, or even just going through the motions associated with lifting exercises. You can try this at home by bending your arms at the elbow to a 90 degree angle and then pantomiming lifting something heavy. By balling your fists as if you’re carrying a heavy load, you’ll stretch your forearm. Moving your arms upward will then stretch your shoulder and upper arm. Although it may sound silly, these movements can really help you retain strength in parts of your body that you don’t frequently exercise. For leg lifts, lie down and fully extend your legs. Lift one up in the air for a second or two and then set it back down. Repeat with the other leg for a balanced practice.